Mid-West Machine™ has been building conditioning grinders for over 65 years. Mid-West Machine™ introduced the traveling grinder to the steel mill industry in 1951 and to date has built over 400 machines. Though hardly recognizable in its 21st century mode, the Mid-West Machine™ traveling grinders utilize PLC’s and computers for its automatic grinding and sequencing operations along with the most technologically advanced components. This insures the most effective material removal machine on the market today. 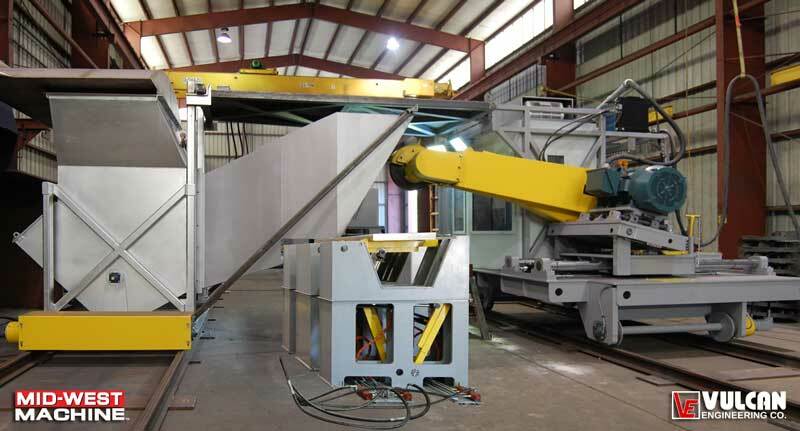 Along with grinding equipment Mid-West Machine™ designs and manufactures various types of peripheral handling equipment to work in conjunction with its grinders. Mid-West Machine™ has set the standard of the industry for decades and will continue to do so for future decades. Vulcan’s new traveling grinder offers a larger work envelope as well as updated controls and hydraulics systems. Vulcan Engineering Co. introduces its newest addition to the Mid-West Machine™ line of Metal Conditioning Equipment with the 6840T. This Traveling Grinder incorporates a longer boom, providing a larger work envelope to process material within 68 inches (1725 mm) horizontal, 40 inches (1015 mm) vertical reach.